This is a painful indictment of bosses everywhere. Is there an evil gene creating bad bosses? Of course not. But it begs the question: How is it that so many managers become bad bosses? There are a number of factors that hurt even managers with the best intentions as they try to lead their teams. Today we’re looking at those factors that contribute to good people becoming bad bosses any what can be done about them. If your career has been longer than a few years, you’re bound to have had a bad boss or two. It would be easy to become bitter and hold it personally against each of them. That would be the easy way, but there is a better way. Instead, realize there are circumstances that make a manager’s job much more difficult. And as you work under them, you will feel many of the negative consequences of this. Keep in mind these situations for when you are a manager, so you’ll handle it differently. Also, consider how you can help your manager be better. Either way, you can take those management wounds and help there be one less bad boss in the world. Competing interests: You will be pulled in both directions, feeling behind on both individual and managerial work. High switching costs: Studies show multi-tasking makes you less productive, and it’s particularly difficult to switch between manager and IC tasks because they’re so different. Stick to what you’re good at: Being new to management, it’s easier and more comforting to do what you’re already good at: IC tasks. Bottleneck for their team: Balancing IC and management tasks can easily lead to holding up your team as you fall behind on work that others depend on. No time for growth: When you’re doing 2 jobs, there’s little time to reflect or learn in ways that could improve things for you and your whole team. Any of these issues could hurt a team, and when they’re combined, they compound to create great frustration and a team that feels they have a bad boss. Being a manager means being a multiplier. There are a lot of bad reasons to become a manager like doing it for the pay, or to call all the shots. Instead, managers need to embrace the skills required to manage well: leading and motivating others, fixing problems, and developing their people. It is these skills that make you a great multiplier. If your manager is getting pulled in both directions as an IC and as a manager, it should be no surprise why even if they want to be a good manager, they feel like a bad boss to you. How to help yourself: If you are a manager in this situation, look for ways to delegate more of your IC work. You can also work on projects that are less dependent on others so you’re not a bottleneck for your team. Finally, focus on making your team more efficient. Remember: making everyone on a 5 person team 25% more effective is worth more than you being a full time individual contributor on your team. How you can help your boss: If you have a manager in this situation, help them anticipate problems. If you can see dependencies and future bottlenecks, help them and your colleagues better plan for them. If you present it less like the manager being at fault and more focused on hitting team goals and deadlines, you’re likely to get more buy in. Despite it being a significant career change from their individual work, most companies provide little to no training for their managers. What training they do get is often packed into a single day long training seminar. These are often inspiring and motivating, but often retention is poor as they’re overwhelmed with ideas, and sometimes distracted by work demands. Knowing this, is it any surprise many struggle with their management responsibilities? Many bad bosses become that way, because no one taught them what they should do. 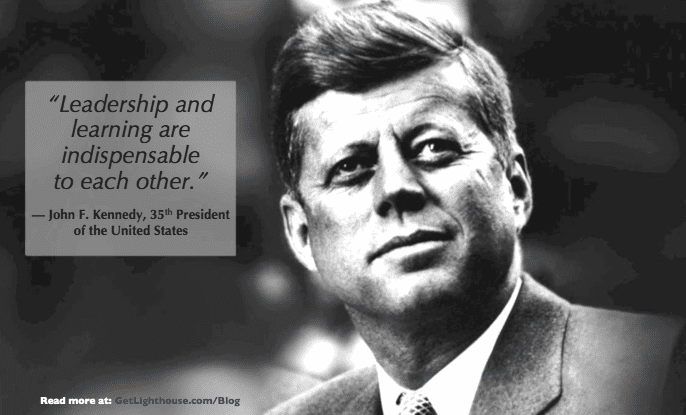 Leadership by example: a double edged sword. When you have great leaders around you, it’s easy to emulate what they do to be successful. Unfortunately, the same is also true for bad bosses. 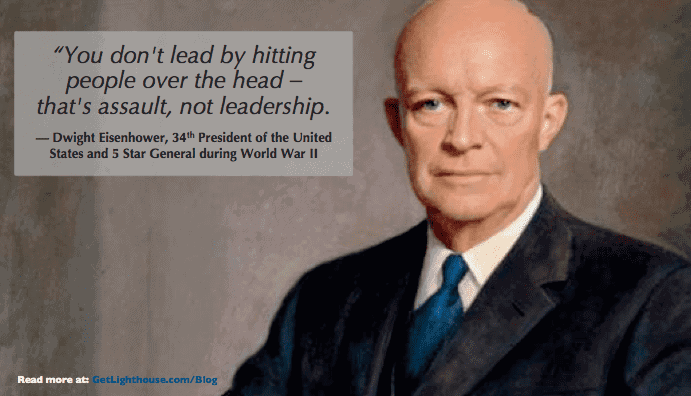 If you’ve only ever seen bad examples of leadership, you are much more likely to follow their poor lead. Young or inexperienced person starts their own company. Company starts doing well or gets funded, turning founders into managers. Having never managed, and undervaluing its importance, they do a poor job. Jaded team members leave, and start their own company. Cycle repeats, creating more jaded employees and future bad bosses. Leadership is an ongoing learning process. To be successful, bosses must fully embrace this. Unfortunately, too many managers aren’t trained, and try to wing it. How to help yourself: If you’re a manager, seek out mentors who are good leaders. It can be really helpful to get perspectives from those that do not work at your current company, so don’t be afraid to look elsewhere. Also, embrace learning by becoming a regular reader. It’s no coincidence that many of the most successful people like Bill Gates, Warren Buffett, and Mark Cuban read dozens of books a year. How to help your boss: You can be a leader, too. If you set an example of learning new skills in your role, you might just set off some ideas in your manager’s head to embrace learning, too. You also may grow your skills to the point you can leave and go to a better team, or even have your own. There is no downside to investing in your own learning and development. 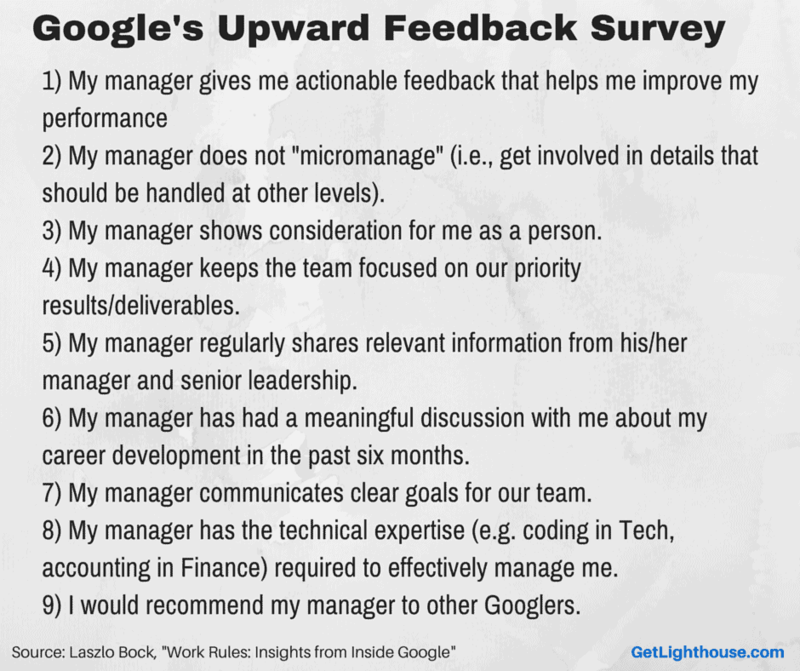 How are managers measured at your company? In most cases, it’s largely based on financial and project results. If the only questions that decide a manager’s performance is, “Did your team meet their OKRs, KPIs, or other project numbers?” then don’t be surprised when that’s what managers optimize for. It’s hard to convince yourself to make time for other aspects of management if you’re being pressured to focus only on task performance. As Google grew as an organization, they really wanted to answer the deep questions about what drove performance. That’s why they formed their People Analytics team. 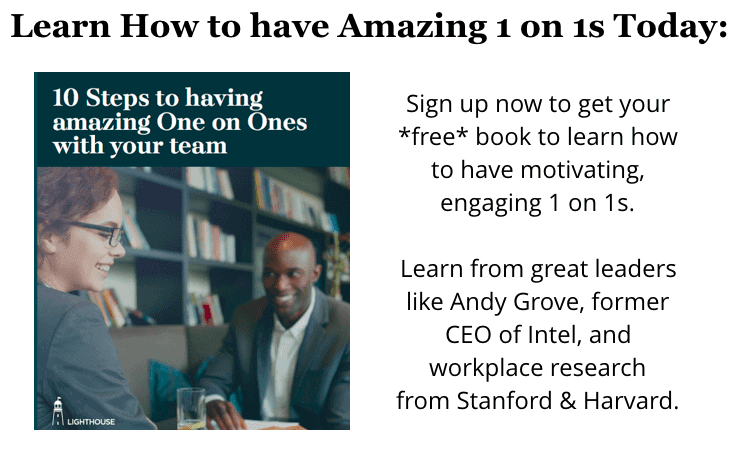 Through their research, they first proved that managers did help teams outperform teams without one. They then set out to determine what was key to being a great manager. From that research, they created the Upward Feedback Survey. 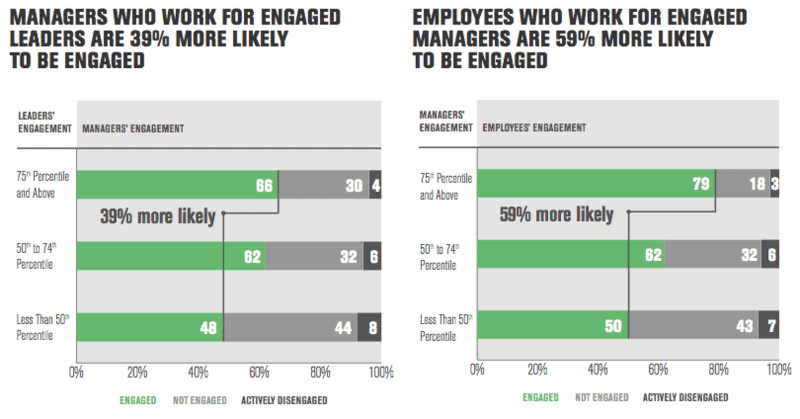 This directly measures the performance of their managers to ensure they do everything the People Analytics team discovered contributes to happy, engaged employees. As you can see in that list, there’s a lot more to being a great manager than just driving results. Bad bosses who get project results will score poorly on the majority of those questions. If your manager is a bad boss, a major factor may be a lack of recognition and reward for doing the things that motivate and retain teams. 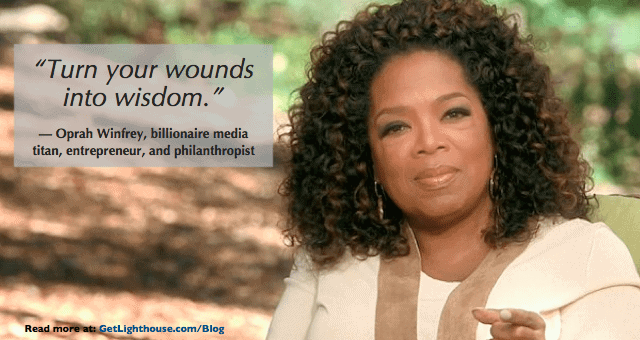 How to help yourself: Knowledge is power. Learn the keys to motivating your team and consider getting help to build the habits (like Lighthouse). 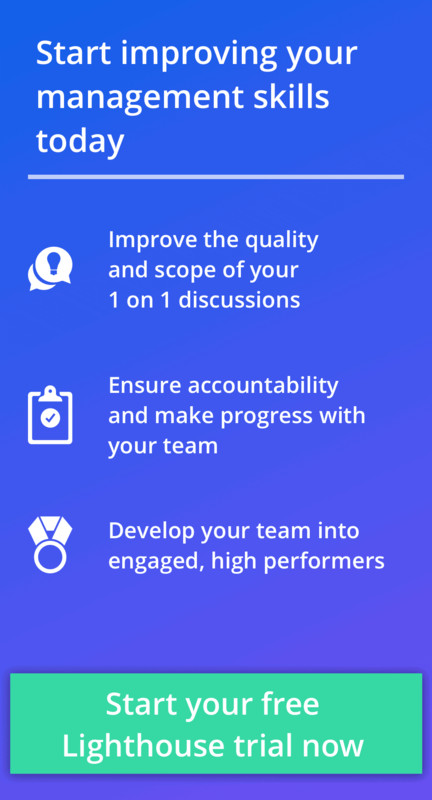 Investing in your skills to motivate and grow your team will help with the numbers you are measured on and help drive the long term performance of your team. How to help your boss: If you learn what motivates you at work, then don’t be afraid to help make life easier for your boss. There are many things you can do to help drive your own career growth. You can also make sure you always bring an agenda to your one on ones so the time is well spent. A friend of mine experienced a form of this problem first hand. He was promoted to manager after performing well in his first year in the company. Unfortunately, as a byproduct of that promotion, his manager stopped meeting with him. At a moment when his Task Relevant Maturity was lowest, his manager abandoned him. Feeling unsupported, he quickly became unhappy and had a hard time succeeding in his manager role. Only after months of unhappiness and colleagues warning his manager, did they start having one on ones with him again. Unfortunately, by that point the damage was done, and the unpredictable levels of support after that led him to leave the company for another job. How to help yourself: The best time to ask for support is at the start. If you get a promotion, ask for specific plans of who and how you’ll be supported. Then push to have the plan followed. Make sure your new boss has one on ones with you as well, so you can get their advice and feedback on situations as they arise. Use an agenda to make sure you make the most of that time. How to help your boss: Having empathy for the fact they may not have much support can go a long way. Show gratitude when they help you and give them the benefit of the doubt if they’re not always perfect. If you know what you want or need, be direct and honest with them, so there’s no doubts about understanding you. One of the oldest motivational methods has a rather innocent name: the Carrot & Stick. It’s a belief that rewards like financial bonuses coupled with strategic punishments is the best way to motivate and retain your people. As we move to a workplace requiring more creativity and adaptability, it turns out that this approach is disastrous. The Carrot & Stick actually reduces productivity in those cases. In a study by behaviorial economist Dan Ariely (as reported in Drive), they tested giving people in India small, medium, and large rewards for a series of tasks. As it turns out, “In 8 of 9 tasks we examined across the 3 experiments, higher incentives led to worse performance.” Similar results were found in studies in London and the United States. Leading to increases in unethical behavior as people push to reach required or rewarded milestones. An expectation for rewards for any task they’re assigned once they start getting rewards. Creating short term thinking as they only focus on immediate rewards (similar to addictive behavior, it turns out). Reduced risk taking to ensure safely reaching the goal, but missing potential greater gains. There’s something instinctual about the Carrot & Stick that every manager must unlearn when they start. In general, you can get anyone to do something through fears, threats, and intimidation for a short period of time. You can also dangle rewards. However, as we see from the research above, the effects damage creativity, which is so essential in the fast-changing markets of the world today. 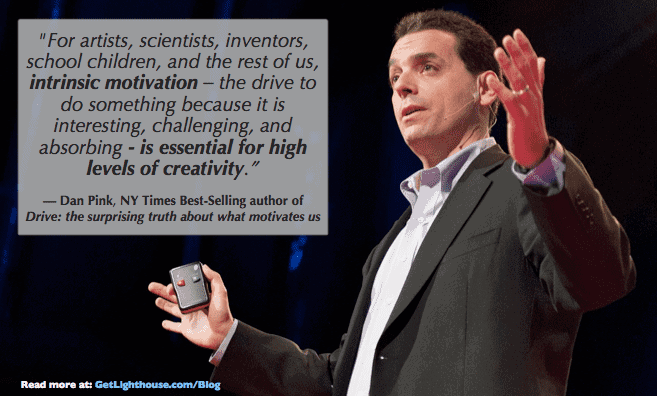 How to help yourself: If you think a Carrot & Stick approach is your best and only way to motivate your team, read Drive by Dan Pink, and learn the ways science and psychology are showing us to motivate the modern workforce. Also, consider one of the most powerful ways to motivate people: investing in your people’s growth, even if you can’t promote them. How to help your boss: This is a tougher situation, especially if they prefer the “stick” of Carrot & Stick. Sometimes the best thing you can do is leave a job or transfer teams if your boss is abusive. Turnover issues is one way that a company will see clearly there’s a problem with a manager. Meanwhile, if they focus mainly on Carrots, try suggesting other forms of motivation. Most managers are good people. 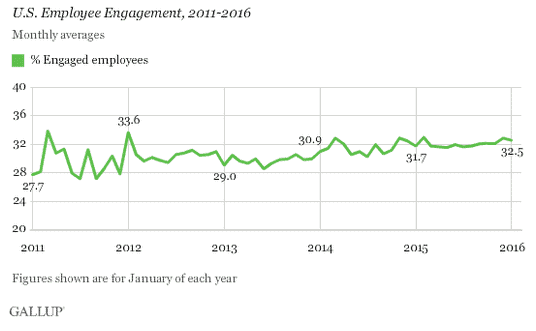 This shouldn’t be a surprising statement, but the engagement rate at work and the popularity of shows making fun of bad work environments (Dilbert, The Office, Office Space, etc) shows that there are many bad bosses out there. Often, a major contributor to this problem is the environment managers are put in. Whether you’re a manager in one of these situations, or an employee feeling the effects of this, realize there are ways you can improve your environment that helped make a good person a bad boss.